I've mentioned before how lucky I am to work with such amazing clients and help capture such important moments in their lives, but another favourite part of my job is being able to explore new places. This doesn't necessarily mean crossing the world or the country to somewhere brand new (although that's pretty great too), but even finding a new corner or a new angle of the city I grew up in is truly awesome. Now I've know Bryan my whole life. In fact, we often joke that he's known my siblings longer then I have - which is sadly true haha. After seeing Josie come into his life as his perfect match and now have them come in to chat wedding plans, I was of course so excited to be chosen as their photographer. 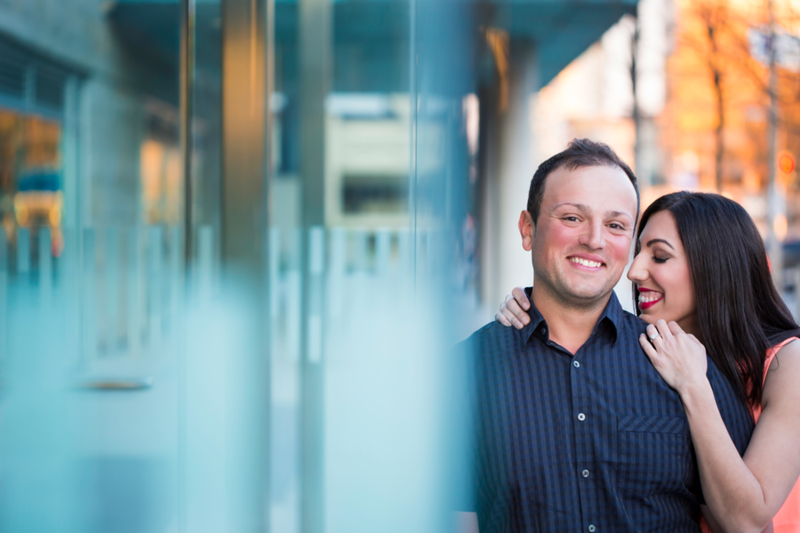 When discussing the engagement session, they knew they wanted something cool - throwing out the idea of a hitting up a local theatre. Naturally, I was pumped as creating custom sessions for my couples is the BEST. We strolled through the downtown core and finished up the evening at the Lincoln Alexander Theatre - a true gem in the heart of downtown #HamOnt. These two are saying their "I do"s in a month and a half - so leave them some love below and stay tuned!